A ribbon is a smart accent for scrapbook pages, floral designs, arrangement for balloons, floral designs, and numerous other craft assignments. Add quality and color to your designs and creations with BBCrafts exclusive assortment of ribbons. Our selection includes cheap and discounted ribbons for all your crafting needs. At BBCrafts, we are enthusiastic about ribbons and are delighted to share our exclusive assortment of this crafty material. If you are in search of something different that can do wonders to your decoration then this is the right place to buy ribbons at wholesale price. These are some of the colorful pieces classified entirely for you. Whether your task requires white ribbon, black ribbon, satin, silk ribbons, navy blue ribbons, grosgrain, organza, offray, printed, specialty or personalized ribbons, we have them all! Our wedding ribbons collection is also essential for anyone who is planning a wedding, but they are also an excellent way to beautify a gift of marriage. By selecting a glamorous style of ribbon, from white ribbon to other colorful choices, you’ll express your receiver that you love and care. No matter what style of ribbon you pick, it’s sure to make your present shine. There’s a huge collection of cheap and discounted ribbons, and we are positive that there is something for everyone. To make the selection easy for you, we have sorted our pieces into subcategories, which will help you to search and pick your piece more quickly. Bring your creativity by adding a touch of personalization to any event. 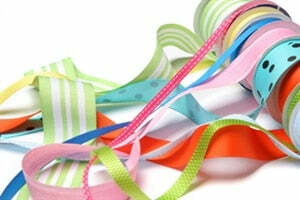 BBCrafts, the wholesale ribbons suppliers, offers you a wide variety of ribbons to shop from!